Pick up a copy at Knife | Fork | Book in Toronto or Brown & Dickson Booksellers in London, Ontario. How do we exist in a world that may have already moved on without us? 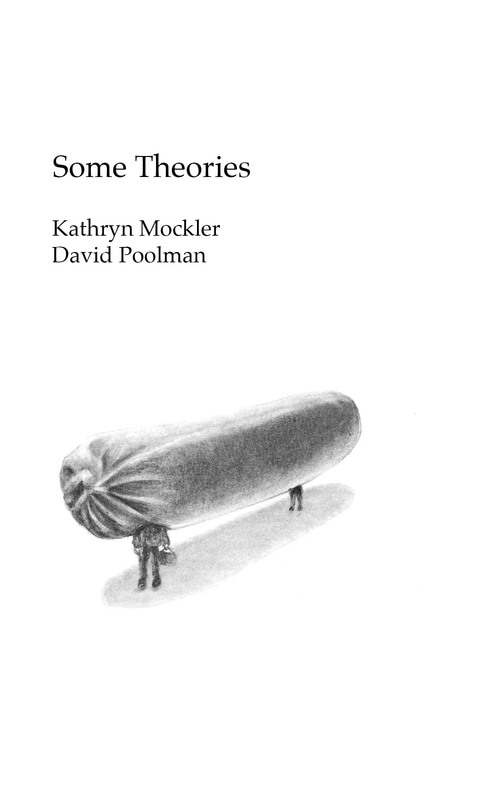 Some Theories is a collection of drawings, little stories, poems, plays, and one-liners that explore failure, dread, resignation, and the end of the world. The future had bought some land and was building his dream house in Muskoka with his own two hands. Even though the work was difficult and backbreaking, he felt he was up for the challenge because he considered himself handy. The past was standing behind the future, in yellow overalls and a backwards baseball hat, watching everything the future was trying to do. Every once in a while, the past would cover his mouth in an attempt to control an eruption of giggles. After looking back at the past with a little glare, the future laid down some boards and hammered some nails trying his best to ignore the rude and inconsiderate disruption. But the more the future hammered, the more the past giggled into his palm. Eventually the giggling turned into an outright laugh and then a high-pitched cackle followed by a stream of tears. The future threw down his hammer and stomped over to the past: —What is your problem? Why are you laughing like that? The past wiped his face and took in some gulps of badly need air. —I'm laughing, he stammered as another fit of giggles started to bubble to the surface, —I’m laughing because when I'm finished with you, there is not going to be anything left of this place.